Innovation center SKOLKOVO is not only a place of advanced developments in the field of science and technology, but also the only urban area in Russia, which creates its unique ID in cooperation with art, in the framework of a permanent public art program. In summer, the first open competition for the best sketch of the art object was held here, which was organized jointly with the city of Innopolis. The work “ArchitecTRON” of the art group MISHMASH won the nomination “SKOLKOVO”. On November 12, the art object will be located in the park area, next to Malevich street. 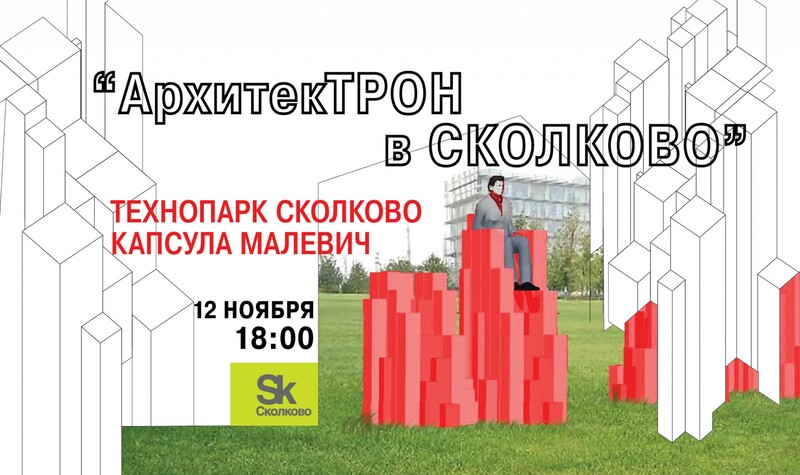 At the creative meeting, the artists Mikhail Leikin and Maria Sumnina will talk about why they are interested in working with the urban environment, why the city needs art and, of course, how and why the Malevich Architecton turned into an Mishmash ArchitecTRON. Speakers: Russian artists Mikhail Leykin (graduate of the Moscow Institute of architecture) and Maria Sumnina (graduate of the Moscow Polygraphic Institute) – nominees of the Kandinsky Prize, Innovation award, members of the special project of the Moscow Biennale of contemporary art, a two-time winner of Design Innovation Award. MISHMASH exhibitions were held at such venues as: Moscow Museum of modern art, Bolshoi Manege, CSI Winery, Bass museum, Centre Georges-Pompidou.